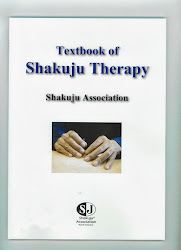 "Shakuju" of Shakuju therapy is the names of disorders appeared in the abdomen; Shaku is one which stays at the deep inside, and does not move easily, and jyu is one which is in the shallow layer and easy to move. The words "Shakuju" originates from the "Nan-jing". Later on, there are periods that Shakuju were interpreted as what would be referred as cancer in the present day, but Shakuju in Shakuju Therapy basically means the pain, hardness and pulsation of the abdomen. By the way, when one practices Shakuju Therapy for a long time, the I-Ching's way of thinking is getting important to deepen its understanding. It can be said as the basis of all Oriental concepts. Simply speaking, the ideas of I-Ching is trying to see everything in the world in yin and yang. Oriental medicine is what is applied this yin-yang concept to the human body. According to the yin-yang concept, when looking at the human body, Shakuju can be explained as Shaku being relatively yin and Ju being relatively yang among the disorders of the abdomen. Then, how do you regard Shakuju, disorders of the abdomen, in the whole body context, with yin-yang idea? The abdomen is located in yin side of the human body. If you would like to deal with disorders appeared in the yin side, the focus would be on the yang side of the body. This is the view based on yin-yang idea; treating disorders of the abdomen with back-shu points is the most distinctive characteristic of Shakuju therapy. Shakuju is the body reaction that anybody can feel and confirm. When supposing that the states which can be confirmed, such as the main complaint and symptoms, are yang, their causes are yin and what cannot be confirmed. Therapists grasp the condition of the deficiency of Jin-qi (yin), which is invisible, and impossible to be touched by confirming the disorders of the abdomen and other reference points (yang), which can be touched and felt. By the way, some people might think that Shakuju therapy examines only the abdominal area (abdominal diagnosis) by its name, but we also do pulse diagnosis and check not only the abdomen, but other reference points, so please do not misunderstand!